Just as the title says. I’m trying to be all nice and quiet while my boyfriend and his friend record an episode of their wrestling podcast (www.untitledwrestlingshow.podbean.com if you’re interested, and the boyfriend also has a sports show I actually listen to every week called Not Another Sports Show, which is also on podbean and iTunes. I don’t plug him just because he’s my boyfriend, I plug him because I believe in him AND because he’s my boyfriend!) and so I’m perusing the internets. With all this wrestling chat in my ear, I decided to try looking for wrestling inspired patterns on Ravelry. Christmas may be over, but it’s never too early to get a jump start on the next gift giving season (given that I’m still trying to finish the man’s xmas gift for _this_ year, that really couldn’t be truer, heh) and besides, I just know he’d smother me with praise and hugs if I knitted him his own Zack Ryder inspired tight pant wrestling style skivvies. And those 2 minutes are what motivate me to try to make it happen. Well, surprisingly (perhaps not), all I found was a luchador inspired ski mask. Eh, not quite what I was looking for. So, Google steered me in a better direction: Lixie Makes It. On that note, I’m going to end here, as the boyfriend has finished his recording. I hope to update again here in the next week or so with a post-holiday “what I’ve been up to” entry. I wanted to share with you some local artwork that has really captured my attention recently. Whenever I can, I love to go art shows. I’d travel all over going to art shows around the country if I had someone to foot the travel expenses. (Attention art and travel magazines/shows! I’m your girl!) I’ve come across a few pieces over the last couple of months that hold a particular fascination for me that I felt I needed to share. This piece, entitled Yin Yang, was on display at Springfield, IL’s Gallery II back in September of this year (2011). I’ve seen Katherine’s work before at 3T, some steam punk inspired arm bands to be precise, and I loved her attention to detail then. When I saw this piece, I couldn’t help but fawn over the way the bettas were intricately put together. 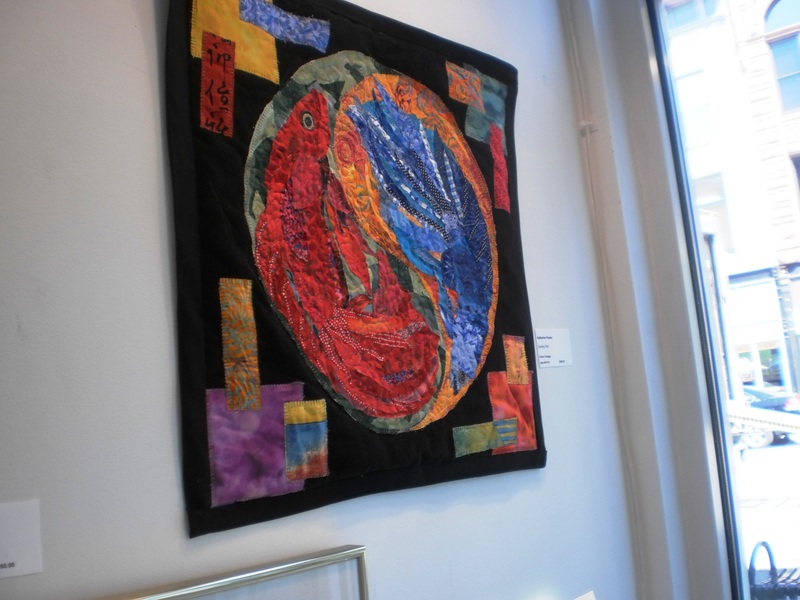 I love when quilting takes on a realism in the imagery. I was also intrigued by the way the edges of the pieces weren’t tucked under. They were raw. Rule breaking. I like that. Last month, I attended a small art show in Urbana, IL called GREEN.art.show. Held at H2O Salon, this was a small local show dedicated to art from recycled materials. 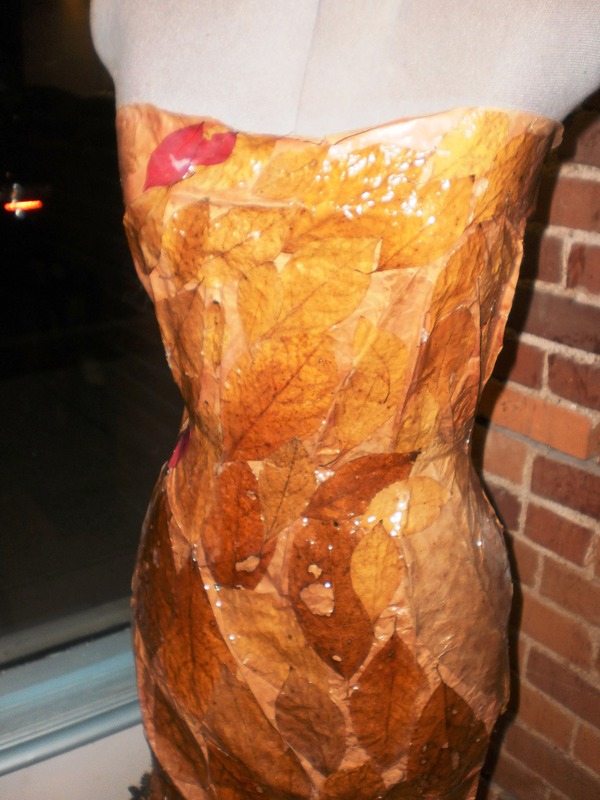 My favorite piece here was a dress made from leaves. Yes, leaves. With a cocklebur trim. I wonder, is that dress wearable? Perhaps not. I love the idea of it though. Also last month, The Pharmacy Gallery in Springfield, IL held it’s opening show. To quote their Facebook page, “The Pharmacy is an artist run co-op, gallery and community center…” I already know most of the artists from doing the 3T shows before. Wonderfully talented lot, all of them. Yet, I have to give my personal best of show to this piece which was a Mary Tumulty/ Ryan Sponsler collaboration. I swear, this photo does not do it justice. I studied this piece over and over. I must have circled through the place a dozen times, but I always came back to this. 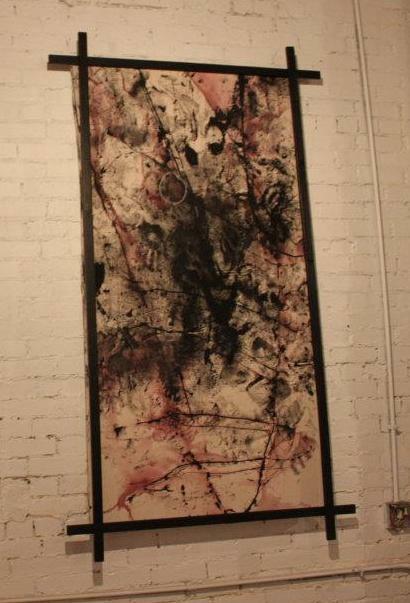 I love the disturbed chaos, the red and black splattered across the canvas. Like the soul of a human being tormented by life… the hands and face dirty from years of hard work, the mind scarred and changed by tragedy and pain. And the stitches! These stitches were Tumulty’s doing. They make this. 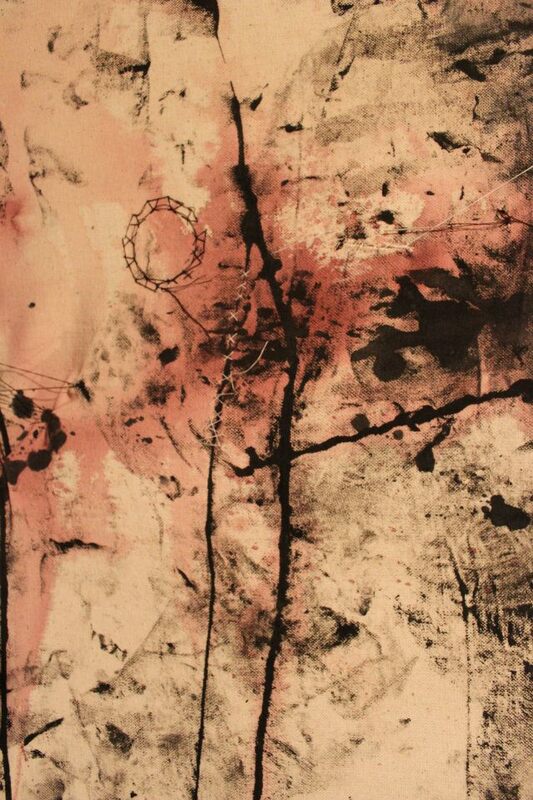 Haphazzard and tangled in places, these stitches physically warp and alter the terrain of the canvas. So, not only do you have the years of pain, the tears and sweat and blood that have been sent sprawling across, but here we can see all the effort to heal. This is everyone trying to survive, trying to pull themselves together, mending themselves in whatever way they can so they can continue to function in society. This is nothing short of a masterpiece.